Hubert was born in the September quarter 1897 in Newport, Monmouthshire. He was the son of Richard (Supt. of Insurance Agents) and Mary Jane Elizabeth (née Naish) Taylor, and in 1901 (Census RG 13/4919) was living at 160 Park Road, Lydney, Gloucestershire, with his older brother, Edgar. Within the next 3 years (1911 Census RG 14/21242) Hubert's family had brought him to live at 22 Crowestones, Buxton. The Census also shows that Hubert had a younger sister, Rita Elizabeth, then aged 7. He had begun work with the 'Prudential Insurance Company'.
" It seems but a very few days since Private Hubert Taylor came over to Buxton for a few days before leaving for France. He was a bright and manly young giant and a Private in the London Scottish. ..... Mr and Mrs Richard Taylor, who for some years lived in Buxton, where the boys were well known and very popular, will receive the sympathy of all Buxton friends in their troubles." Hubert enlisted in the London Scottish Regiment at Hastings, Sussex. His Medal Index Card shows that he entered the War in France after 1915, as he was not eligible for the 1914/15 Star Medal. His Service papers have not survived and without them it is not possible to say what his War service postings were. However, by comparing with records of men with similar Service Numbers, it seems likely that Hubert attested early in December 1915 and mobilised from the Army Reserve in early May 1916. That being the case he would have been posted to France a short time (possibly just a few days) before he was killed in action - supported by the 'The Buxton Advertiser' report quoted above. The 1/14th (County of London) Battalion (London Scottish) was a Battalion of the Territorial Force, based in August 1914 at 59 Buckingham Gate, London, part of the 4th London Brigade, 2nd London Division. It moved on mobilisation to Abbotts Langley and on the 16th September 1914 left the Division and landed at Le Havre. The Battalion was engaged at Messines on the 31st October 1914 under the command of Cavalry Corps. A week later, on the 7th November 1914 it came under the command of the 1st Brigade in the 1st Division and on the 8th February 1916 transferred to the 168th Brigade in 56th (London) Division. The London Division had been disbanded in 1914 but in January 1916 the War Office authorised the re-formation of the London Division, now to be known as the 56th, in France. The Division began to concentrate in the Hallencourt area on the 5th February and was largely completed by the 21st February. Assuming he enlisted as outlined above, Hubert would have joined his Battalion either in preparation for the coming Battle of The Somme, or as a reinforcement during the course of the many engagements. The night before the start of the Battle, 30th June, his Battalion moved forward from Bayencourt on right of Division ready for an attack on Gommecourt, its right flank close to the Hebuterne-Puisieux Road. The Battalion suffered heavy casualties during its advance across No Man's Land. The German front line was reached before a withdrawal to the British line during the evening. The Battalion's casualties numbered 590. Hubert spent several turns in the front line over the next two months, particularly the Hebuterne trenches, before the Battalion was pulled back and on the 22nd August entrained at Doullens for St. Riquier and from there marched to Drucat. From Drucat practice attacks with tanks were carried out. On the 31st August the Battalion entrained again at St. Riquier for Ville-sur-Corbie and from there marched to Sally-au-Bois. On the night of the 17th September they relieved the l/5th London Battalion in the trenches north-east of Leuze Wood, along the road running between Leuze and Bouleaux Woods - Combles Road. They were in action north of Bouleaux Wood on the 25th September, advancing southward along the light railway to within 500 yards [457 m.] of Combles. On the 7th October 1916 the Battalion attacked the German gun-pits and the southern end of Hazy Trench, which were held after hand-to-hand fighting and strong counter attacks. Casualties for the month were given in the Regimental history as 531. They reached Fremont on the 10th October and ten days later began to move into the Laventie sector. Hubert was killed in action on the 28th October 1916, one of eight men of his Battalion to die on the 28th/29th October, the first casualties of the month, the result of shelling. 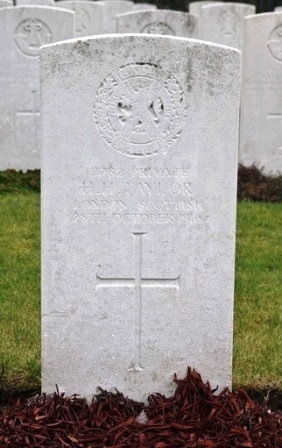 With these other seven men of his Battalion he is buried at Laventie Military Cemetery. "After ten days rest at Fremont it moved northwards with the 56th Division to take over at Laventie, and on Oct 28 relieved the 1/8th Royal Warwicks in the breastworks of Fauquissart sub-sector. By way of welcome the enemy heavily bombarded our line while the relief was taking place and though we had few casualties they blew our works about very badly and gave us two months' hard work repairing them."